Hypervolemia is also known as “fluid overload” and occurs when the body retains more water than it needs. The process of excreting excess water is mostly controlled by the kidneys and certain disorders can disrupt this mechanism and cause fluids to disperse into the tissues of the body. Sodium in the body helps to balance the fluids. Too much sodium increases the fluids in the body and too little sodium decreases the fluids in the body. Normal sodium intake will not cause hypervolemia, however certain conditions cause the sodium levels to rise too high causing fluid retention or hypervolemia. When this happens, the heart becomes strained trying to pump out the excess fluid. It cannot effectively pump out all of the excess and the fluids begin to remain in the tissues of the body. Places this is found are the; lower legs and ankles, hands and arms, abdomen and in severe cases, the lungs. Hypervolemia is caused by a disruption in the salt/water balance in the body. This can happen from short term illness, injury or surgery and can also be due to long-term health conditions. Intravenous Fluids – If intravenous fluids are given at too fast a rate, hypervolemia can develop. Fluids need to be given at a rate that the heart can keep up with to maintain fluid balance. Also, most intravenous fluids contain 0.9% Sodium Chloride which can keep the fluids from filtering through the kidneys at the proper rate. Injury/Illness/Surgery – The kidneys respond to a hormone in the body called Anti-Diuretic Hormone (ADH), some illness, injuries, surgery and other stress on the body can disrupt the balance of this hormone and cause the body to retain fluids. Kidney Disease – Kidneys that are not functioning well are unable to excrete the proper amount of fluids. People with hypervolemia due to kidney disease, usually require kidney dialysis in which a machine pulls of the excess fluid. Liver Disease – The liver works together with the kidneys to excrete toxins from the body. When the liver is weakened due to liver disease, fluid may build up in the abdomen. This type of hypervolemia sometimes requires a procedure to extract the excess fluid from the abdomen with a needle. If liver disease becomes too advanced, the patient may also require dialysis due to kidneys being overworked. Heart Disease – This happens when the heart becomes weakened and can no longer pump proper amounts of fluid through the body. This leads to the excess fluids settling in the extremities and often the lungs. What are the symptoms of hypervolemia? The most obvious symptom and method of diagnosis is weighing daily. If you gain 5 pounds or more overnight, then the problem could be hypervolemia. Keeping a journal of daily weights over a week can help your doctor decide if you have hypervolemia. The first line of treatment for hypervolemia is reducing the intake of fluids. In the hospital, the doctor may order less IV fluids or restrict fluid intake. At home, the doctor may only let you have up to 2 liters a day of fluids or less depending on the amount of swelling. Good foods that can help season foods are; lemon juice, lime juice, lemon pepper, herbs and spices that do not contain salt. Doctors may prescribe a “water-pill” or diuretic which helps the body to pull off excess fluid. It is important to follow your doctor’s instructions with these and eat foods high in potassium. Diuretics can deplete potassium and it may need to be replaced. Good foods that contain potassium are; Bananas, oranges and orange juice, baked potato with skin, strawberries and over-the-counter salt substitute. Keep swollen feet elevated above the level of the heart. (See Figure 3) This will prevent pooling of fluids in the lower legs, ankles and feet. You may need to wear compression stockings until the swelling is well-controlled. While sitting with your feet up, try some ankle exercises to increase circulation. Try eating asparagus or drinking asparagus water. Asparagus is a natural diuretic and can help the body release excess fluid naturally. Make sure that your condition is not too severe before trying this option. Most cases of hypervolemia need to be evaluated by a physician first. 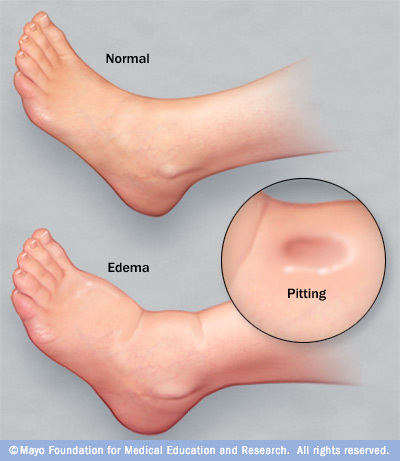 Hypervolemia is a fluid excess in the body. It can put increased workload on the heart, kidneys and liver. If you are having hypervolemia, it is important to comply with restricting fluids and/or sodium in the diet. This needs to be done carefully so that electrolyte balances remain stable. Mild episodes of hypervolemia may be able to be managed at home, but often more severe cases need to be managed in the hospital. If your doctor gives the okay for alternative home remedies there are many safe home remedies that can help reduce the fluid excess right at home.